St Andrew’s Square was completed in January 2011. This upscale setting is perfect for your next event. With accommodations for up to 150 guests, this room is perfect for any occasion. Dock 7 is the larger of our two banquet facilities, with 5,490² ft and seating for 250 guests. This event is perfect for wedding receptions, public events, and live music. Dock 7 is the perfect fit for your next conference, holiday party, celebration of life, wedding reception or any social gathering. 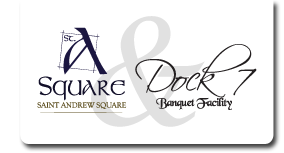 Dock 7 has a large dance floor and stage, a full-service bar, and an attached courtyard (great for outdoor ceremonies). This is a great space any time of the year! Let us handle your next birthday, wedding, or business meeting. We invite you to stop by to see our facilities; our staff is happy to help. To schedule a planning meeting, or request information, please contact Event Planner, Jeremy Monday.